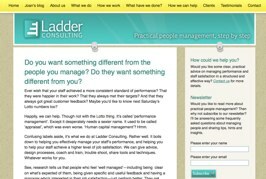 Gavin Wray designed this elegant website for management consultancy Ladder Consulting, which I then turned into a WordPress theme. The site contains a blog, as well as a number of hierarchical pages which are all controlled by WordPress’ easy-to use CMS. The site looks great in all browsers and is very accessible to all.